Sometimes life takes the most unexpectedly delicious turns, delivering one not to where he might have expected but to where he was surely meant to be. Five years ago wonton mee-loving Muar native Goh We Peng was a student at HELP University. There, he made the acquaintance of fellow Johor-ite Tan Chu San. Goh and Tan's relationship blossomed as many in Malaysia do, over bowls of noodles and plates of rice and talk of food. One day the couple wandered into Section 17's Restoran K Intan, where the specialty was wonton mee, featuring fresh noodles that the old uncle running the shop made himself in a small back room. One mouthful and they were hooked. Goh and Tan had found their definitive noodle (the char siew, or barbecued pork, was pretty tasty too). They celebrated their discovery by eating at the shop everyday, becoming close to the older couple as they became better friends themselves. Eventually the old uncle, impressed by Goh's enthusiasm, volunteered to teach him the art of noodle making. The younger man was keen, but he and Tan finished at HELP and left Kuala Lumpur before he could take the uncle up on his offer. While Tan remained in Johor fresh graduate Goh headed to Singapore to take up an entry-level accounting position. After a year in shirt and tie he decided that eight-hour days and the physical comfort of a desk job in an air-conditioned office weren't for him. Goh left Singapore and returned to Johor, where he and Tan pondered their future. They'd not forgotten the mee master's offer. 'It was fate,' surmises Tan. They returned to Kuala Lumpur and undertook tutelage in Section 17. 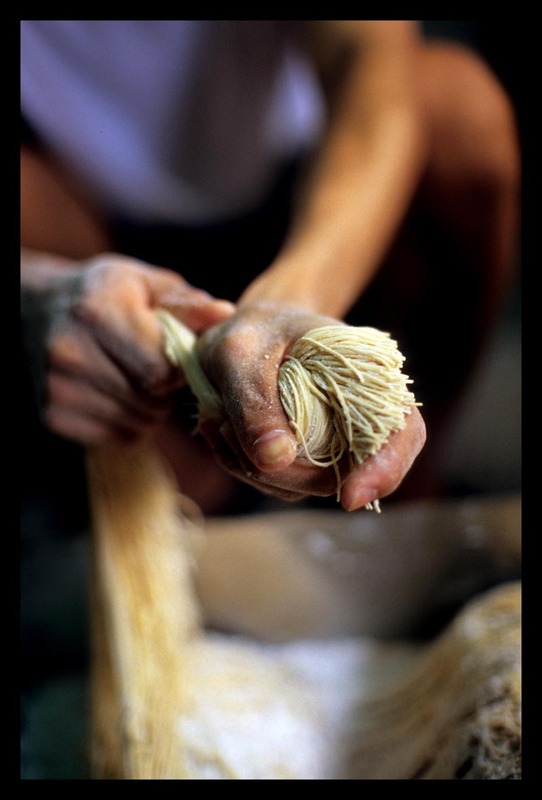 As the uncle showed Goh how to spin skeins of springy noodles from flour and eggs and coax sweetness and char from strips of pork belly, his wife taught Tan how to make wonton and keep a food business humming. After three months they were on their own, selling wonton mee and char siew from a coffee shop in Setapak. Business grew as word of Goh's handmade mee spread, and then ground to a halt after just nine months, when the coffee shop's owner inexplicably reclaimed their stall. At Restoran K the old uncle's health was failing. He was looking to sell his business. Goh and Tan returned to PJ to work with the uncle and his wife and, a month later, took over lock, stock, and barrel. As their twenty-something peers enjoyed late nights and carefree weekends the couple threw themselves into sixteen-hour days devoted to attracting new customers and winning over long-time regulars wary of their youth and relative inexperience. In the kitchen, they learned by trial and error, soliciting customer reactions to the incremental changes they made to the shop's menu. As he perfected his char siew Goh attempted to reconcile conflicting diner preferences for fat versus lean and crispy blackened bits versus clean, uncharred met. Tan began serving siu gao (boiled dumplings), tweaking the filling's seasonings by the day. The stout old gua lu ('hanging' roaster) in a corner of the restaurant's half-open kitchen did double duty as Goh undertook to perfect a siew yoke ('three layer' roast pork) recipe given him by a friend of Tan's mother. ('We threw away many pieces of pork at the beginning,' he confides, shaking his head with a smile.) Tan introduced her mother's chicken feet and mushroom stew to almost immediate customer approval. They hired one worker, and then one more. Goh made mee every morning before service started, and then through the day disappeared into the back to whip up new batches once, twice, three times as demand required. Days remained long (the couple re-opens the shop in the evenings for bak kut teh and more noodles). Relatives and not a few friends questioned the couple's willingness to work so hard for so little obvious reward. Their modest goals for the business include hiring another worker and introducing more dishes to the menu. One of these days the couple, who registered their marriage at the end of 2005, would like to have a proper traditional wedding. But there's little time now for the distraction of planning. 'Right now it's Do Do Do. We must pay attention to every detail and can only think about working hard for a good result,' Tan explains. But there is one major change afoot. Before the end of the year Goh and Tan will hang a new sign christening their restaurant 'Jiu Siang' ('forever fragrant'), a name that symbolizes their dedication to serving mouth-watering mee (and other dishes) for a good, long time. Restoran K Intan (soon to be Jiu Siang Noodle House), 616 Jalan 17/10, Petaling Jaya. 9a-3p and 6p-9p. Tel. 012-754-1287/012-756-1214. makes me want to go eat wanton mee rite now! !..omg the photos seriously makes me want to go learn more about my dslr now.. This was an excellent post! Your storytelling is so beautiful. And Dave's pictures speak volumes! I *so* wish I could frequent this shop every day like Goh and Tan did with Old Uncle. *sigh* perfect noodles, perfect char siu, perfect siu yoke... I'd never leave. lotsof - these mee are truly excellent. (And BTW, I'm not the photographer, so it took me a coupla minutes to figure out what 'dslr' is!). Nate - thanks. We did this for our monthly food column in a local mag. This story has a big 'aaawwww' factor, of course, but it really is a great one. How many kids in their mid-20s choose to go into the profession without inheriting the business from family? They are doing what they do because they truly love it, pure and simple. 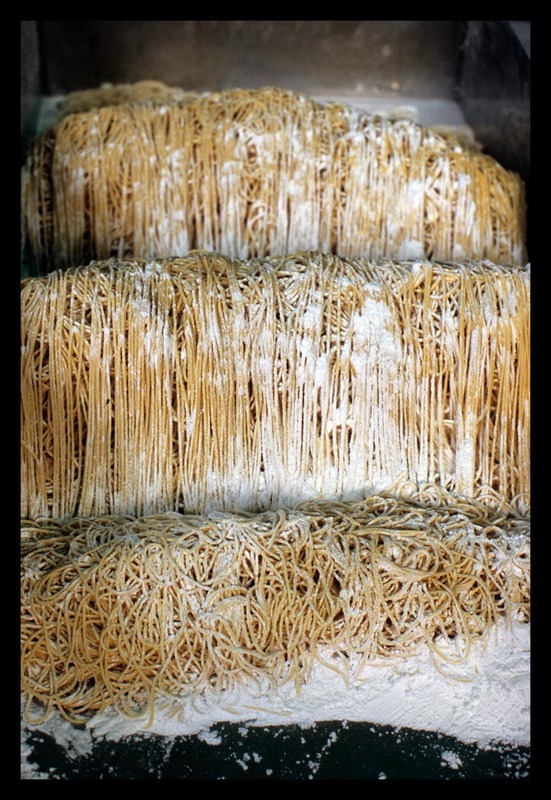 Also: Those noodles look just about perfect. I may as well just give them up right now. Thanks a lot. Robyn, what a FABULOUS story! The often fickle hand of Fate was definitely on the side of these two, and everyone who gets to eat at their place. Truly delicious - thank you for sharing! Great story telling. 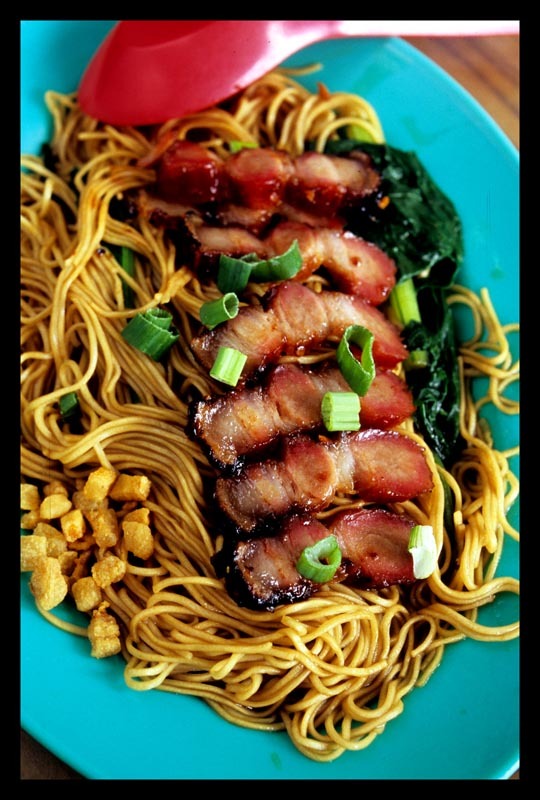 The wonton mee with Char Siew and deep fried fat looks delicious. The Siew Yoke looks mesmerizing. If I can remember, Sentosa cinema is in Section 17. I have watched many movies at Sentosa. My favorite wonton mee stalls were Koon Kee and Ho Weng Kee. Both of them were located in the Chinatown area. It has been awhile, more than 20 years. This makes me want to semi retire in KL. Thanks for the post. a - thanks. The mee are great. I'll talk more about his method in the follow-up post. Jennifer - thanks, and you're welcome. There was something about these two, and then when she told me their story ... destined for print! Hi Meng - I don't know Sentosa Cinema. This Restoran K Intan isn't in the part of Sxn 17 where the morning market it, but a few blocks over in a quieter area. I'm sure if they were in one of the better-known coffee shops they'd do much more business, but as it is they were filling up pretty fast on a recent Sat. morning. Oh.. how i miss a good wanton noodles..! I loved this post, and the beautiful photos. I didn't want the story to end. The pictures are stunning, if one can be stunned by pictures of noodles and char siu, like me... and the story is charming as well! What a great way to start my workday with a cup of coffee, now I must find noodles for lunch. Mama BoK - really nothing like a good wonton mee, is there? rosie and sandy - thanks. This was a fun story to write photograph. Come back next wk for a follow-up post in the restaurant's kitchen. I love all your pictures!! And they make my really hungry now!! I can't wait to go to Malaysia now to taste all my favourites!! 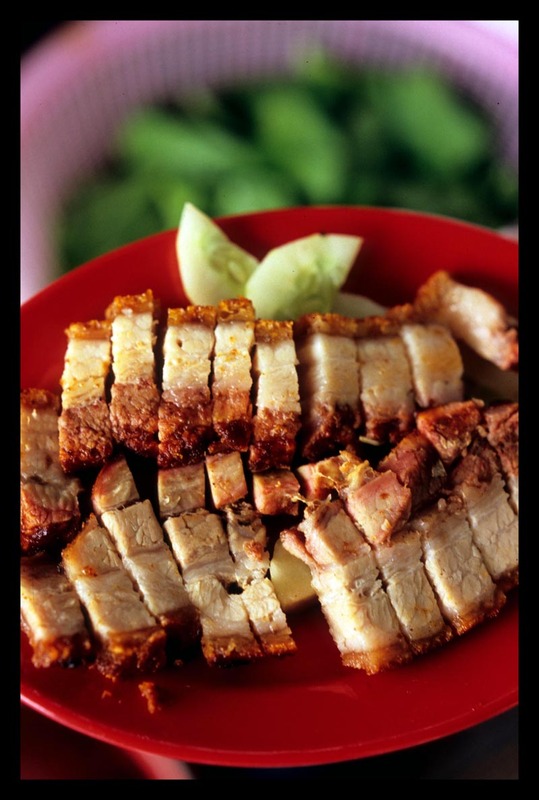 I love Char Siew! Yummmmmm! 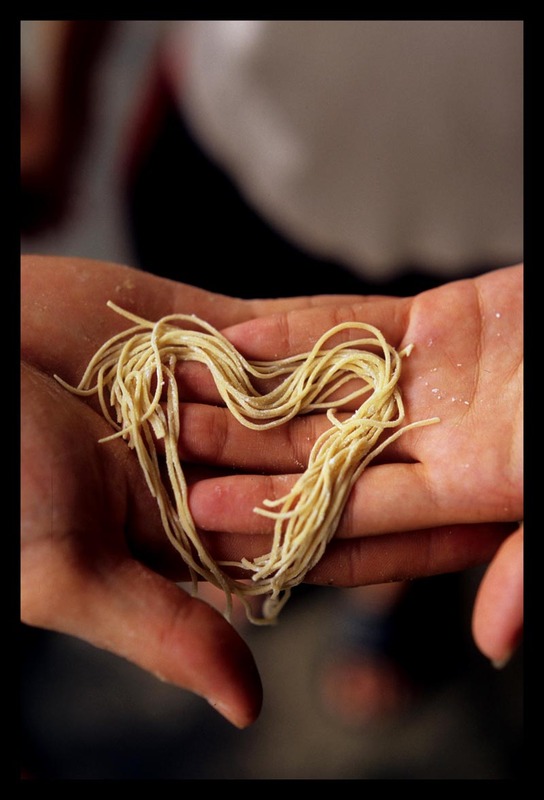 How do they make those noodles?? 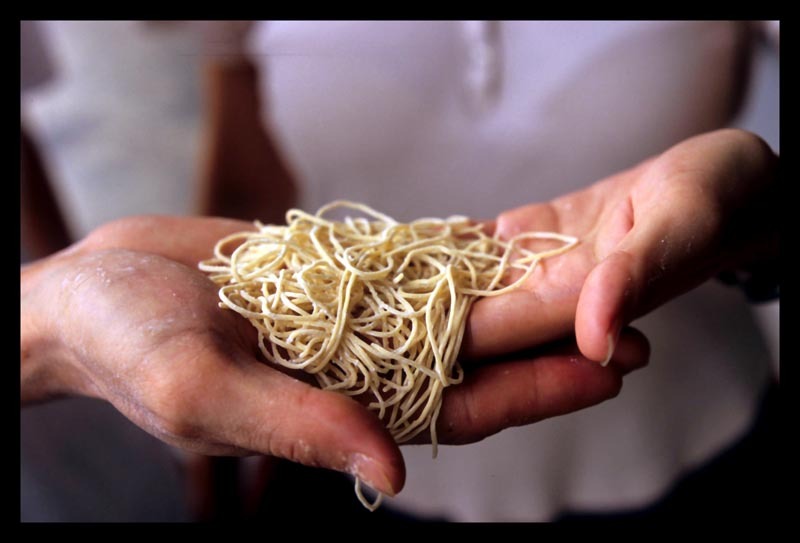 I want to make noodles that are "springy like a rubber band but not stretchy!!!" Hang on Jim - a follow-up post will take us into these kids' kitchen (though we can't possibly impart with words and photos Goh's secret touch with flour,water, and eggs). Probably this week. Great write up, I like this place! !